An abbreviated workshop containing some of the best bits of our full medieval life workshops for those schools where time or space are short. A good overview of medieval arms & armour and surgery & medicine. Display area: School hall, gym, drama room, dance studio, or similar large indoor space. Can be run in a large classroom if space is short, though this will restrict trying on of armour a little. 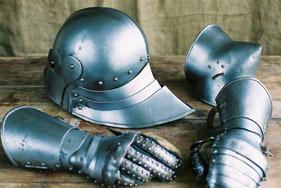 This workshop focuses on armour, weapons and surgery of the War of the Roses but also includes some 11th C armour. In a typical one hour workshop we will tell the students about the armour, let all of them try it on themselves; demonstrate how weapons such as the long sword or pole axe might have been used and let all the students hold a blunt replica sword. 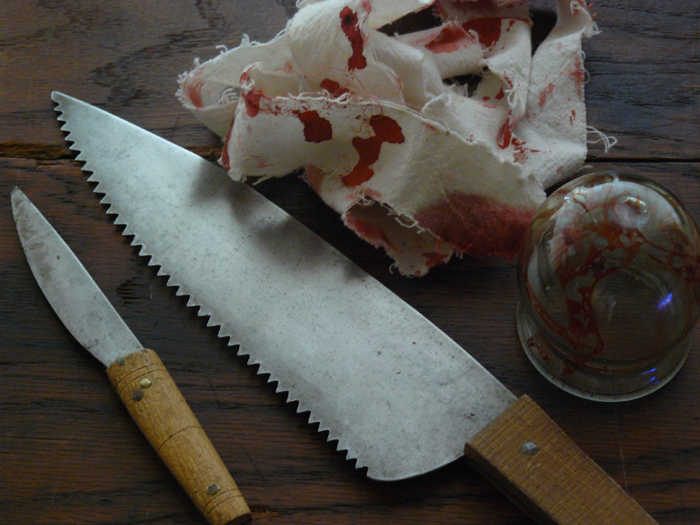 They will also learn about some of the horrors of medieval surgery from amputations to blood letting and arrow extraction. We bring along live medical leeches to show! A great workshop for schools on a budget. It includes the most exciting and gruesome elements of our 2 hour workshop. Also great for those with limited space and hall usage time.